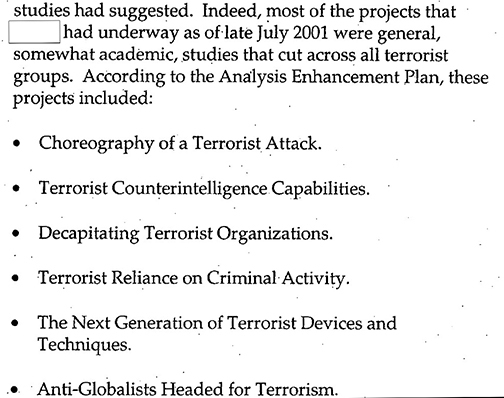 Two Central Intelligence Agency reports on the problems of the CIA's Counter-terrorism Center (CTC), one issued in August 2001, a little over two weeks before the 9/11 attack, and the other issued in June 2005, contain much of the information in the missing 28-pages from the Joint Inquiry into Intelligence Community Activities Before and After the Terrorist Attacks of September 11, 2001. Former Senator Bob Graham (D-FL), the chairman of the Senate Intelligence Committee, and a principal author of the joint inquiry report, has, along with three senators and three U.S. representatives, urged the 28 pages to be declassified. 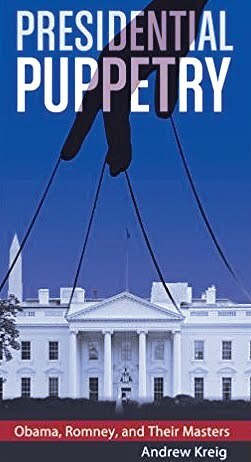 The first report, classified SECRET NOFORN [No foreign dissemination], is the "Inspection Report of the DCI Counterterrorism Center Directorate of Operations," dated August 2001. The second report, classified TOP SECRET/HCS [Humint Control System]/SI [Special Intelligence]/NOFORN/ORCON [Originator controls dissemination and/or release of the document] is the "Office of Inspector General Report on Central Intelligence Agency Accountability Regarding Findings and Conclusions of the Report of the Joint Inquiry Into Intelligence Community Activities Before and After the Terrorist Attacks of September 11, 2001." Both reports are heavily redacted. 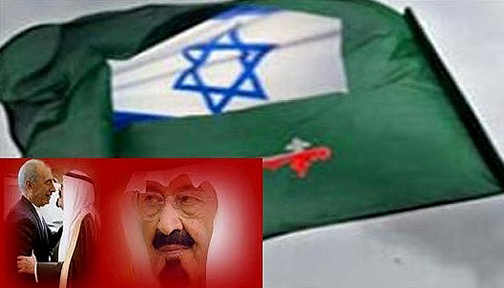 The information revealed in the second report, which was prepared in response to the findings contained in Graham's report, bolster WMR's previous reports that the missing 28-pages link Saudi government officials to the 9/11 attack and imply that Israel withheld important intelligence from the United States on the impeding attacks and may have been in collusion with the Saudis to see that the attack was carried out. 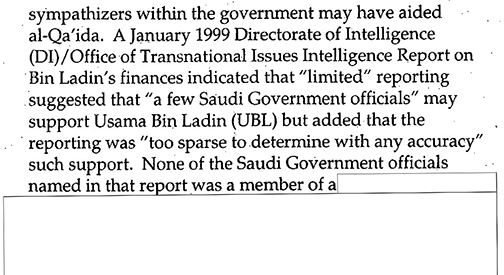 The most damning revelation is on page 20 of the second report from 2005, which implies that the CIA's CTC took a sabbatical on all "intelligence reports" (IRs) on terrorist activity in Israel, Saudi Arabia, and Yemen. Yemen was the ancestral home of Osama bin Laden. The report states that CTC personnel did not prepare any terrorist activity summaries during the late spring or summer of 2001 that provided any assessment of the overall threat. BY not focusing on Israel, Saudi Arabia, or Bin Laden associates' activities in Yemen, other U.S. intelligence agencies were blind to the impending attack. "Although the CIA used many vehicles to inform the policymakers of the threat [of impeding terrorist attacks], CTC analysts did not write any Intelligence Report (IR) or similar product during the late spring or summer that provided any assessment of the overall threat. IRs earlier in the year warned of threats in Saudi Arabia, Israel, and Yemen; between mid-May 2001 and 9/11, however, CTC wrote no IRs that provided a comprehensive analysis of all the threats being received [emphasis added] or that put the then-current warning environment in context. In fact, the few IRs that CTC wrote during the late spring and summer included no threat warnings at all." In other words, the CTC ignored reports emanating from the Drug Enforcement Administration, Federal Bureau of Investigation, U.S. 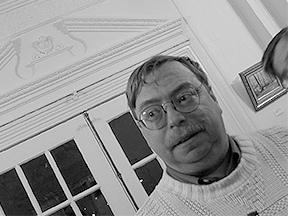 Marshals Service, Environmental Protection Agency, U.S. Coast Guard, National Guard, state and local police, and other agencies about fake Israeli "art students," all with experience as Israeli military and intelligence operatives, casing federal facilities and offices, as well as the homes of federal employees, all within the same areas where the alleged 9/11 Saudi, Egyptian, and Yemeni hijackers maintained residences. 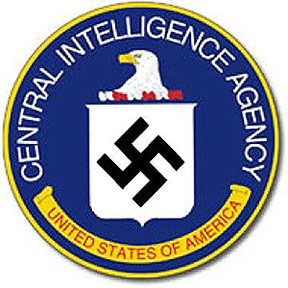 The CIA's Counterterrorism Center "stood down" during the height of seemingly joint Israeli intelligence and Arab hijacker activity that ranged from Jersey City to Hollywood, Florida and Irving, Texas to San Diego. 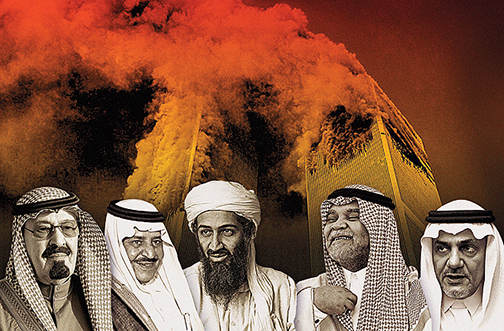 WMR was told by those who read the missing 28-pages from the Joint Congressional report that Saudi-Israeli collusion in the 9/11 attack can be extrapolated from the footnoted material. 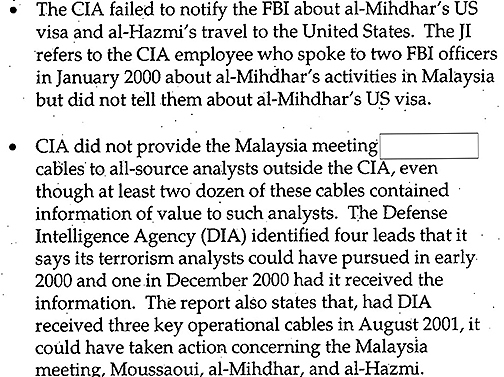 The June 2005 CIA report largely provides the information that remains redacted in the Joint Inquiry. 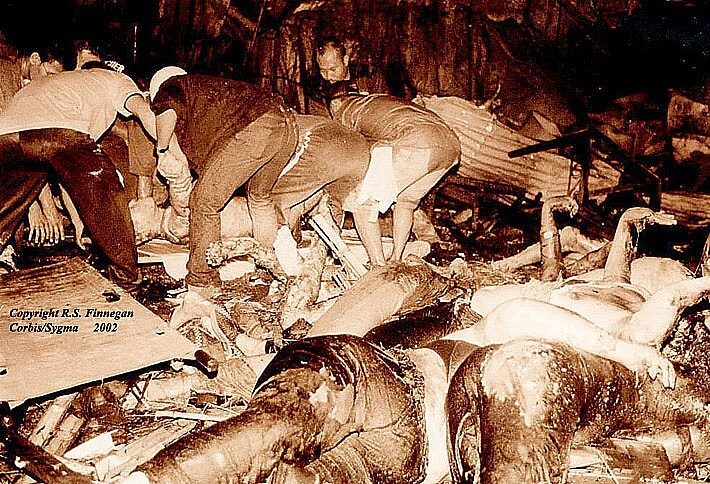 Page 227 of the second report also states that critical CIA intelligence assets were devoted in the six months preceding 9/11 not to Al Qaeda, which was a demonstrated threat to the United States, but to "Hizballah" or Lebanese Hezbollah. While Hezbollah is a sworn enemy of Israel it was not a hostile threat to the United States. The report states, " . 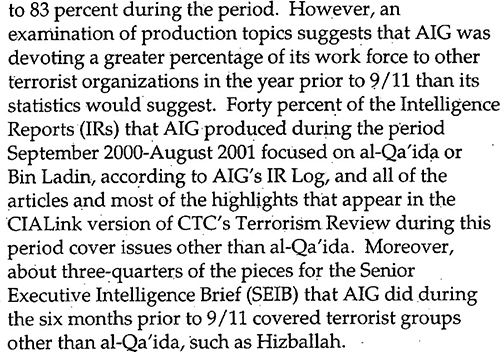 . . about three-quarters of the pieces for the Senior Executive Intelligence Brief (SEIB) that AIG [Assessment and Information Group] did during the six months prior to 9/11 covered terrorist groups other than al-Qa'ida, such as Hizballah." This fact also indicates Israeli intelligence and pro-Israeli neo-conservative interference with the U.S. intelligence posture prior to 9/11. 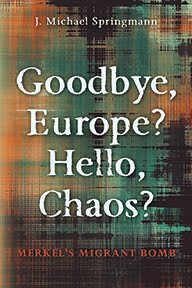 Page 257 suggests that the CTC was as much or more concerned about "anti-globalists" committing terrorist attacks in July 2001 than Al Qaeda. The 2005 CIA report also states that the Joint Inquiry criticized the CIA for devoting too much time on non-Al Qaeda threats. 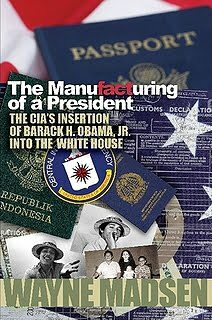 The CIA report also states that according to the Joint Inquiry (JI), the CIA withheld information from the FBI about the pe-9/11 planning meeting in Malaysia of Al Qaeda hijackers Nawaf al-Hazmi and Khalid al-Mihdhar and al-Mihdhar's visa to enter the United States. 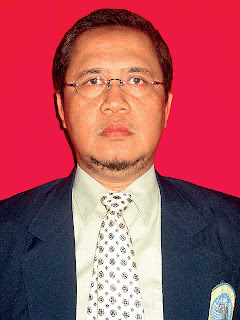 Nor was action taken on four Defense Intelligence Agency (DIA) leads on al-Mihdhar, al-Hazmi, Zacarias Moussaoui (the so-called "20th hijacker"), and the Malaysia terrorist summit. This is an obvious reference to the DIA's Able Danger program that was abruptly shut down after 9/11. Page 324 of the CIA report states that the Joint Inquiry criticized the CIA's over-reliance on "foreign services to develop human sources," thus meaning that the CIA had "insufficient focus on unilateral operations." 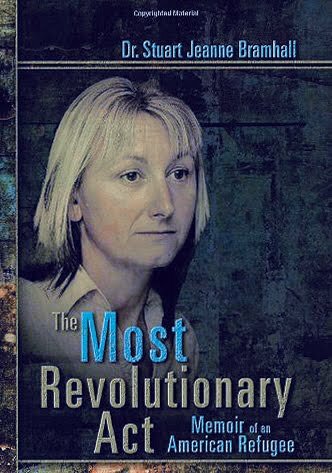 It is known that one of the foreign services that the CIA relied on too heavily for human intelligence, even intelligence that proved bogus and incomplete, was Israel's Mossad. 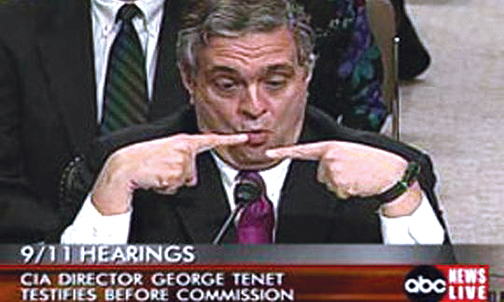 In a February 16, 2005, memo from former CIA director George Tenet to the CIA Inspector General, Tenet states that his plan to concentrate CIA intelligence gathering on the sanctuaries of Bin Laden and his associates in "Sudan, Lebanon, Yemen, and, most importantly, Afghanistan" were briefed to "former Secretary of State Henry Kissinger and former DCIs Helms and Woolsey." Kissinger and Woolsey are known ciphers for Israeli intelligence. Kissinger and Woolsey, private citizens at the time of their briefings by Tenet, likely served as important leaks to the Mossad about what the CIA knew about Al Qaeda's future plans. The CIA report notes that a few officials within the CTC and the CIA's Near East Division speculated that "dissident sympathizers" within the Saudi government may have aided Al Qaeda and that "'a few Saudi Government officials' may support Usama Bin Laden (UBL)." The section of the report dealing with Saudi government complicity in 9/11 is heavily redacted. WMR has previously reported that among those Saudi officials who aided and abetted Al Qaeda and the 9/11 attack was present Saudi King Salman, the Governor of Riyadh province in 2001, and Prince Bandar, the Saudi ambassador in Washington who was so close to the Bush family he became known as "Bandar Bush."